When you're travelling with carry-on luggage, we have everything you need for a weekend break in the sun! Over 72 million of us visited a country in Europe last year, and 13 million of those visitors travelled to Spain. Weekend breaks that are just a couple of hours flight time away have become increasingly popular, with low-cost airlines such as Easyjet and Ryanair making it easy to hop on a plane on a Friday evening to spend a few days in the sunshine. 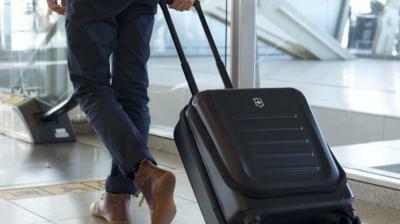 Fly-savvy travelers who want to avoid long queues at check-in and the baggage carousel often opt for cabin-only suitcases so it's important to be in-the-know about what you can (and can't) pack if your case is going in the hold. You can take toiletries or other liquids that are in containers no larger than 100ml but all items must fit in a single, transparent and resealable plastic bag, which holds no more than a litre and measures approximately 20cm x 20cm. This includes liquids, gels and aerosols. Here at Techniblock, we have an excellent range of sunscreens and insect repellents under 100ml so they are absolutely ideal for a few days away. 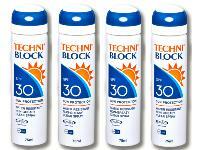 Techniblock's SPF 30 and 50+ sunscreen comes in a 75ml aerosol spray, which is well within airline limits. One canister provides all-over body protection for an adult for 2-3 days and if you take advantage of our twin-pack or 4-pack bundles, you'll save money and have enough to last a whole week! We also have an SPF 40 with citonella, which is a natural insect repellent, great for those who might need protection against sunburn and irritating insect bites. Our Peaceful Sleep range includes an aerosol spray in 85ml, as well as a handy 30ml stick that comes in the original, DEET-based formula or a kid-friendly option that is DEET-free so if you're off on a family trip, this is suitable for children from 6+ months. We have also put together a bespoke weekend pack containing a 75ml sunscreen, an 85ml insect repellent, our SPF 50 Anti-Ageing facial protection and a lip balm, perfect protection for a weekend in the sun. These handy, travel-size cans make travelling with only carry-on luggage a breeze! It means you'll have less stuff to lug around and you'll avoid having to pay baggage fees and, let's face it, checking in your bag can double your flight price! Plus, there's no chance of the airline losing your case if it isn't checked. Techniblock cans are airtight and sealed with a twist-top, locking lid so there's no risk of the sunscreen leaking all over your kit and once you've arrived at your destination, they are small enough to pop in a rucksack or back pocket for protection on the go. Simple!